Painting flowers pots is an easy craft project that can add some character and style to your normal flowers pots. Paining your own flower pots lets you get the color and design that you want, without having to pay for the overpriced ones at the store. 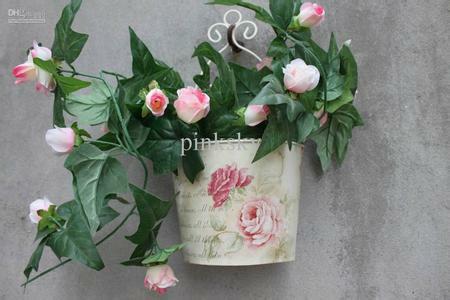 In fact, you can take an old flower pot, or even just a cheap throw away plastic one and paint it to your liking. Here's how to paint flower pots. Firstly, find yourself a flower pot. It could be a quality old flower pot that has a design on it that you dislike, or, it could be a cheap plastic flower pot that plants typically come from. Any flower pot will do, because your paint job will make it attractive! Secondly, clean your flower pot well, especially if it has ever been used before. You need it completely debris free, and dry, so that your paint will stick. Thirdly, put a base color of paint on your flower pot and let it dry. This will help other paint colors stick to the flower pot better. Fourthly, choose your flower pot design and paint away. Painting flower pots is fun because you are unlimited as to what you can choose for a design; try polka dots, or stripes for simple designs. If you're feeling artistic, try drawing an intricate vine flower to flow around the curvature of the flower pot.